Chris Smith is the son of John W. Smith, who is an amazing knifemaker and has been building dress and tactical folders for two decades. While Chris’ work doesn’t command the same prices, his tactical stuff is very similar to his Father’s tactical work. While I’m not sure if Chris is still making knives like his father (I don’t think he is), his work is very good. He started making knives in the early 2000’s and I have not seen anything new from him in the last 5 years or so. His knives commanded prices from the mid 300’s to 400’s, which is a good value given the quality of his work. 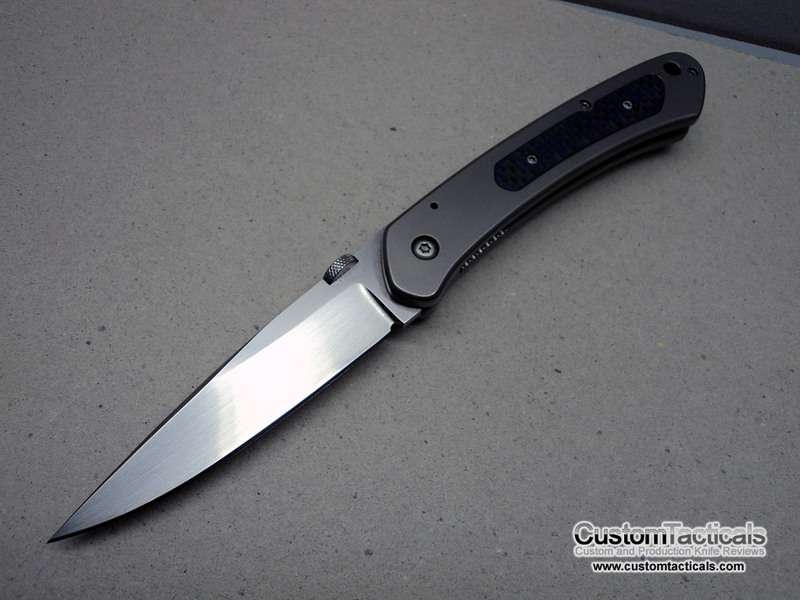 This particular piece features many of the same hallmarks as JWS used on his tactical folders: G-10 inlays, blasted Titanium frame and liners, hand-rubbed blade finish. The blade features a long, narrow droppoint design, very much in the style of his father, JW Smith. The finish is of the hand-rubbed variety, and done quite well. I would have liked a bit crisper grind lines, but its fine the way it is. Opening is done via an ambidexterous thumb disk, which works well and is easily accessible. 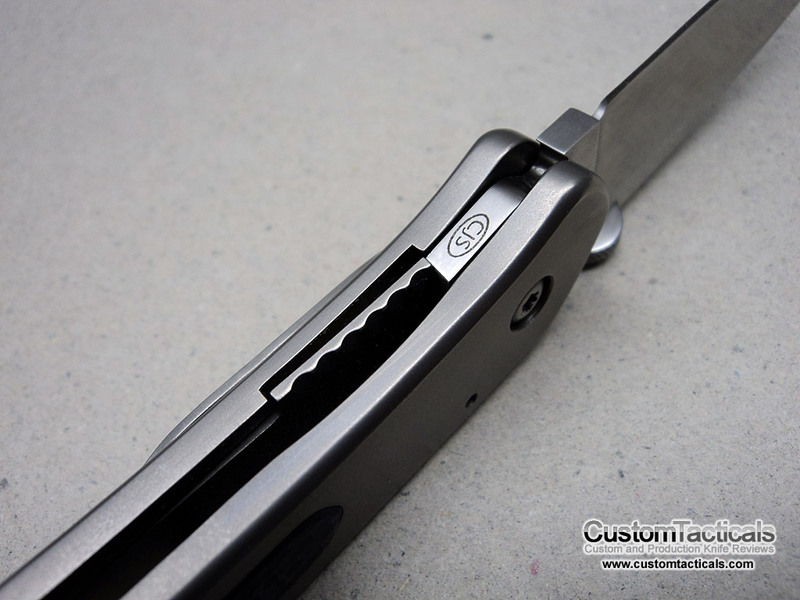 The handle is done very well, with the G10 insert fitting perfectly in the slot. The entire handle is beadblasted, and there is a full backspacer. Ergonomics are very good, especially for a knife as narrow as this one. 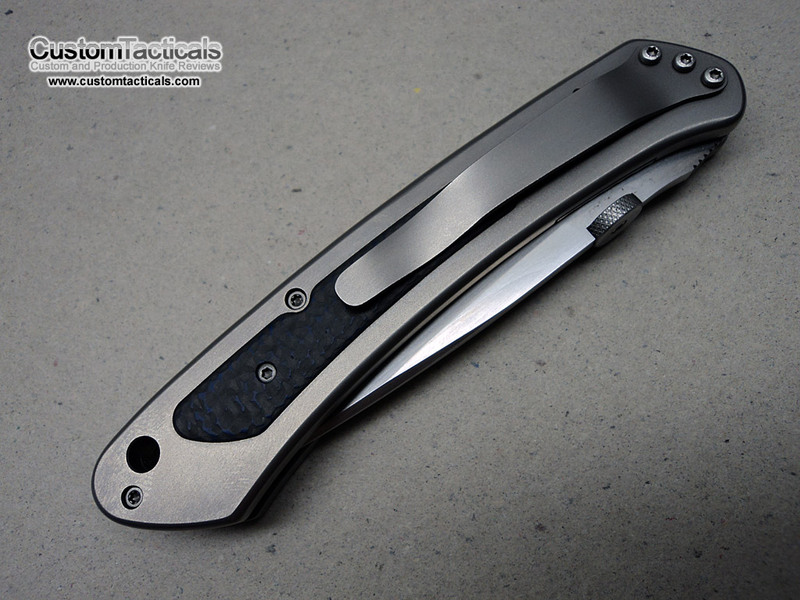 The trend seems to be towards fatter blades, which is definately not the style of this knife. The G10 inserts have sort of a checkered finish to them, giving the user some extra grip. The lock is interesting.. while it looks like a linerlock, and most would even call it a linerlock, it is not. Its an “insert” lock. The handles are full slabs of Titanium, with a titanium lock bar that is cut and fitted into a machined slot inside the handle. The operation and function are more or less identical to a linerlock, but the final look is a bit cleaner. The fit and finish on this example of Chris’ work is fabulous. I have heard some say that his workmanship is not quite as good as his father’s, but in this example, I could not see any defficiencies. This is a perfectly executed folder in terms of fit and finish. Overall a very satisfying piece of kit, with a very high level of fit and finish from what I would consider a very talented knifemaker. While I don’t think Chris is still making knives (please let me know if I am wrong! ), perhaps his father would be willing to service some of his previous knives if the situation were to arise.